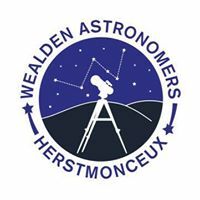 Wealden AS, formally Hastings and Battle Astronomical Society, have been volunteers at the Observatory Science centre Herstmonceux since 1994. We regularly meet at the Centre for our group meetings and help to support and promote astronomical activities during the Science Centre's open evenings. A full list of society meetings will be available shortly from the Wealden AS Meetings section. A list of viewing evenings and special events we will be supporting at the Observatory Science Centre can be found in the Wealden AS Events section. Membership information and copies of our society newsletter is available from our membership page. However only Wealden members will be able to access the newsletter. In the meantime, please join us on Facebook where we have a group page with some of our photos and videos created by Society members. You do not need to be a Facebook user to view the Wealden AS on Facebook page and please remember to add us too.